This week, our friends at Content Marketing Institute paired with the amazing MarketingProfs released their 4th annual report on all things content marketing: B2B Content Marketing: 2014 Benchmarks, Budgets, and Trends—North America. As we’ve come to expect from their reports, this one is brimming with clearly presented data and sharp insights into the state of content marketing today. As we’ve written about here, visual content is the future. Dynamic visuals are a great way to break through the noise and engage your audience, which is why more marketers are turning toward infographics to share information. In fact, the study found that marketers used them more than ever this year. Even when compared to 27 other content marketing tactics, including mobile apps, podcasts, and social media, infographics still saw the biggest rise in usage by marketers. 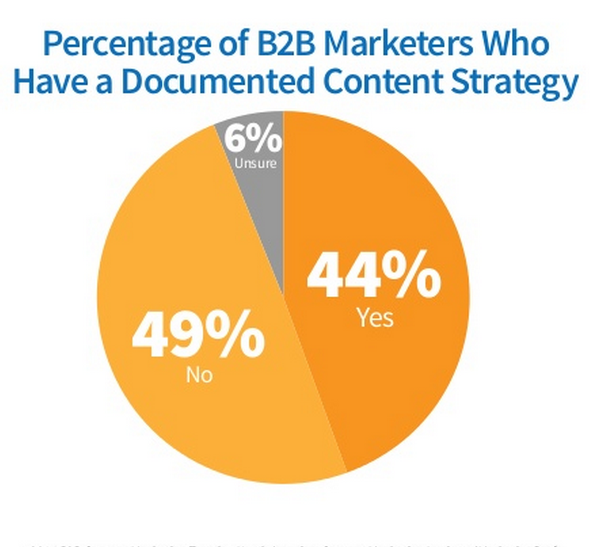 In 2012, only 38% of B2B marketers were using infographics to showcase content. This year, that percentage rose to 51%. For more about visual content marketing, check out our SlideShare on the subject. Interestingly, small companies (between 10 and 99 employees) are much more likely to have someone who oversees content marketing strategy than large companies (1,000+ employees) – 78% of small companies reported having such a person, versus 58% of large companies. 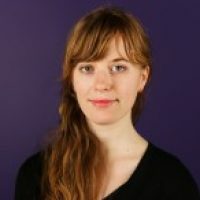 Relatedly, writing is the most frequently outsourced marketing function – a whopping 64% of marketers said that they hire external writers to create their content. 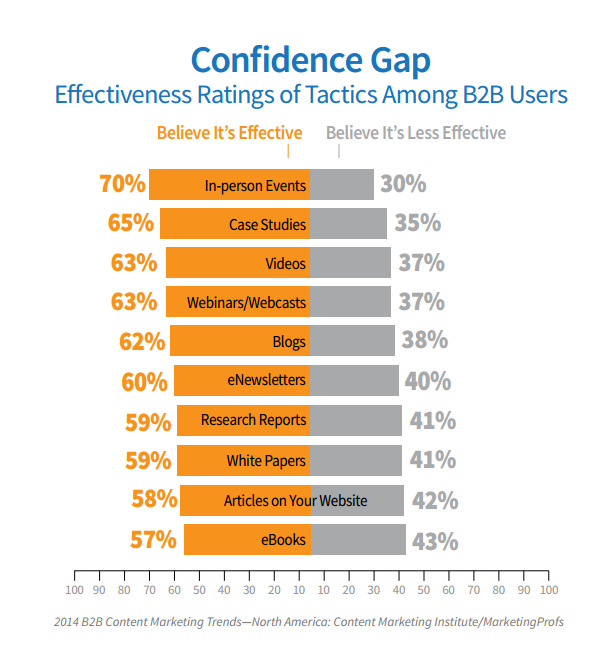 The Confidence Gap: Are Blogs More Effective Than Events? When asked about their confidence in content marketing tactics, the overall consensus was that in-person events are the most effective way to reach an audience. 70% of respondents had confidence in the effectiveness of in-person events, which was higher than overall confidence in case studies, videos, webinars, and blogs. But when you narrow it down to only the best marketers (those who gave their companies scores of 4 or 5), the group actually had a higher confidence in blogs (79%) than in physical events (76%). 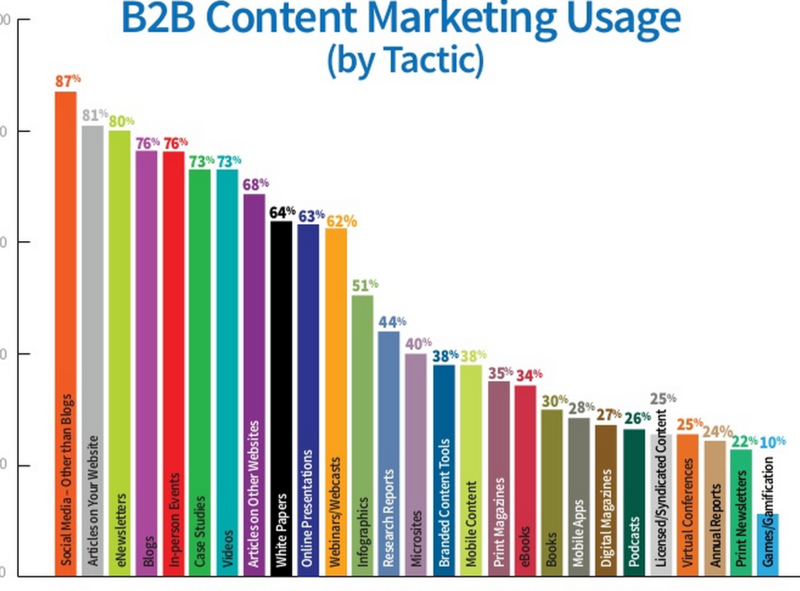 On the other hand, only 29% of the lowest scoring marketers said that blogs were effective. Are less effective marketers publishing less effective blogs, or are they simply not investing enough in their blogging programs? 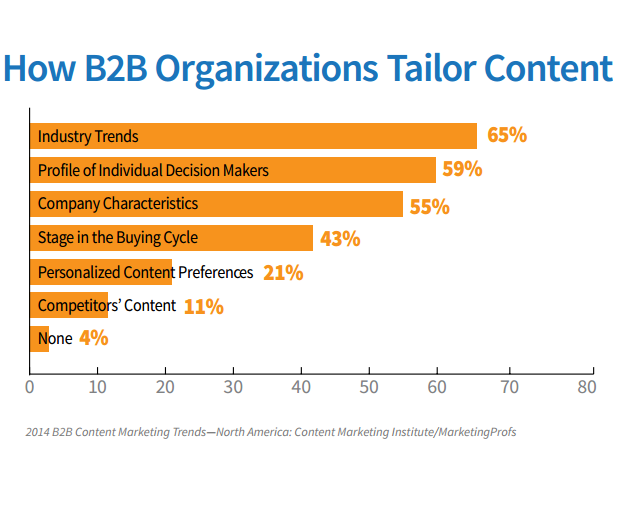 While B2B marketers are most frequently tailoring their content to match industry trends, around half are segmenting in response to profiles of decision makers, company characteristics, and each prospect’s stage in the buying cycle. While creating engaging content was technically cited as the third biggest challenge among marketers (behind lack of time and producing enough content) I would argue that adequate time and bandwidth are essential pieces of engaging content creation. Content marketers got more budget in 2013 than in 2012, and over half of the companies surveyed plan to increase their content spend. But while budget can address the first two problems (more budget=more content producers; more content producers=more content), producing engaging content takes more than money. In fact, to create content that your audience will actually engage with, marketers have to win at every challenge on this chart. They have to produce a variety of content (challenge #4), and they have to accurately measure their content’s effectiveness (challenge #5). If their content marketing is integrated across marketing (challenge #7), they’ll find measurement and variety much simpler to control and plan. For the complete run-down, check out the full report on SlideShare. Do these results match your experiences? Content marketers, are you expecting bigger budgets in 2014? 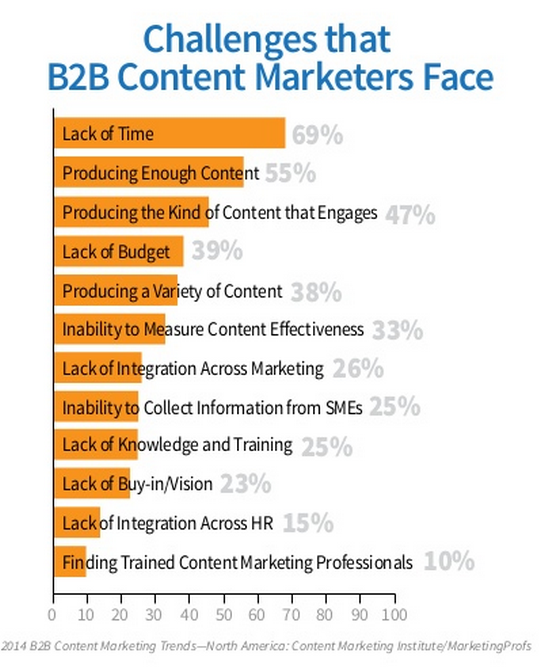 What were your biggest challenges in content marketing last year?